Life cycle: Bees lay their eggs continuously throughout the year except in extremely cold periods. All forms of the honey will hibernate in the hive. They live in large colonies with one queen, with many female workers a few male drones. They make honey from nectar collected from flowers. 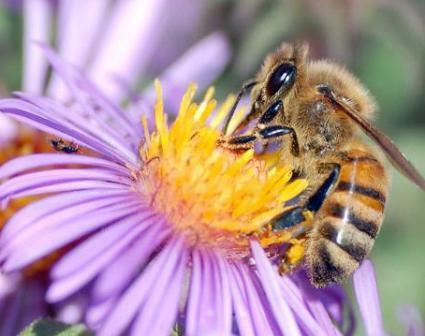 Feeding characteristics: The worker honeybee travels between a great variety of plants (usually one species at a time), feeding on the nectar, and transferring the much-needed pollen from the male portion of the flower to the female. Orchards are especially dependant on honeybees for pollination.